It goes without saying that the person who could be the most influential when it comes to where we received our sense of style is our mother. We learned from her how to set the dinner table; we watched from the top of the stairs as she elegantly and effortlessly hosted evening soirees; even something as simple as our birthday party had its special flair thanks to a mother’s touch. We all try every day to do what we can to thank that special and irreplaceable person that not only gave us life but also helped shape us into the unique people we have become. However, there is no better day to remind her just how spectacular and distinct she is than the day we celebrate moms, grandmas, aunts, or any of the other amazing women in our lives that helped us become who were are today. After the years she spent serving and celebrating us, this spring Fineline Settings is excited to help you serve and celebrate her with a touch of elegance that will wow and impress her ever discerning eye! She’ll rave to all of her friends about your chic sense of design and style and will never forget just how special you made her Mother’s Day. Your special lady will be happily surprised at the quality and durability of the Renaissance collection as you serve her on one of our dishes filled with the Lasagna recipe that you had watched her make for your family throughout your childhood. 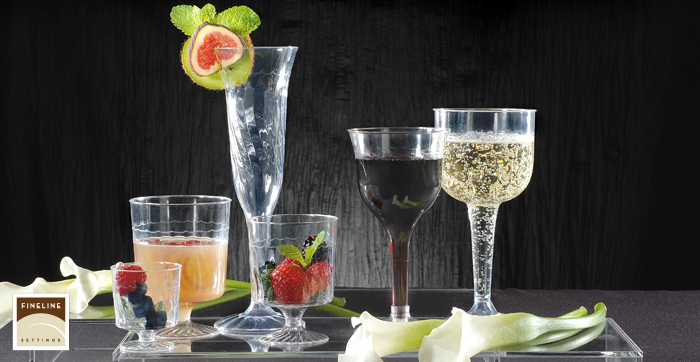 She’ll delight as she sips a well-deserved glass of pinot from one of our beautiful 6 oz wine glasses in our Wavetrends collection or in one of our tumblers from Savvi Serve. 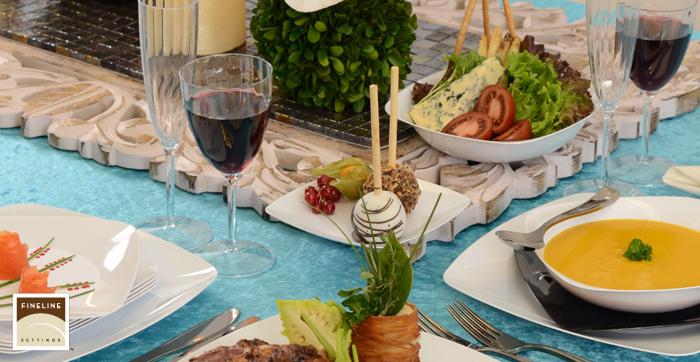 No matter whether it’s just the two of you or it’s the entire family, Fineline Settings will be there to help you entertain like a pro with the ease of premium disposable plastic tableware this Mother's Day! We know that our customers want the spotlight to be on their mother without the exhausting clean-up; and we know that no matter the collection you choose, you’ll serve mom with confidence and grace. Just be careful… don’t make it look too easy! 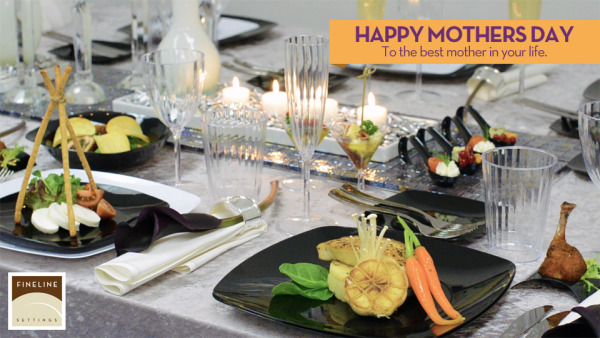 We are always on the search to help make your celebrations a sensation; Mother’s Day was especially important to us that we share the top of the crop of event ideas and recipes with you. After doing some searching, we’ve found a few ideas that will help make your Mother’s Day celebration a smashing success! Our friends over at Hostess with the Mostess Blog are here to help inspire your Mother’s Day bash! With party planning and decoration ideas that dance from a sunny-side Brunch to a pastel Garden Party, you’ll find all you need to get inspired to give your mom the best day ever! We all have those recipes that were a staple in our childhood and nothing beats mom’s home-made. Even so, we have managed to find recipes that we think will bring back the happy nostalgia of your childhood for both your mother and you! Mom always said eat your vegetable because she was wise enough to never forget how important healthy eating and healthy living was. We managed to find some healthy dessert recipes that will delight everyone and taste as unhealthy as the originals! The recipes below are brought to you by Katie, a blogger who makes it her goal to provide her followers with healthy version of classic desserts on her blog “chocolate-covered Katie”. We know, it seems impossible… but so did the idea of beautiful and disposable dishware. All of us here at Fineline Settings send thanks to all of the mothers who have shaped us and supported us in all that we do. We could not have been half of what we are without your love, your guidance, and your own unique style!